So now my refrigerator was cleansed from all the tempting unhealthy foods and was filled with nutritious foods. I had dusted off my steamer and had purchased an amazing new blender. I had talked about the “Eat to Live” diet for two weeks now and my start date, July 1, 2012, had finally arrived. There were no more time outs left. It was time to jump in and do it. 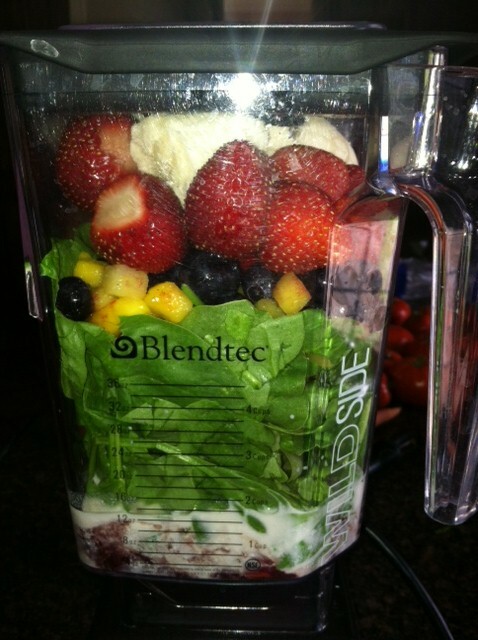 That morning, Pam and I prepared a fruit and spinach smoothie like the one Pam blogged about earlier. I was afraid that the smoothie would not fill me up or leave me satisfied, however I was pleasantly surprised. Now the smoothie did not leave me stuffed like I normally feel after eating a stack of pancakes, a couple of eggs, hash browns, bacon, toast and orange juice, but it did leave me satisfied. I did not feel bloated, groggy, or out of breath. It was like eating just the right amount. My hunger was gone and I felt nourished and energetic. It was enough but not overdone. 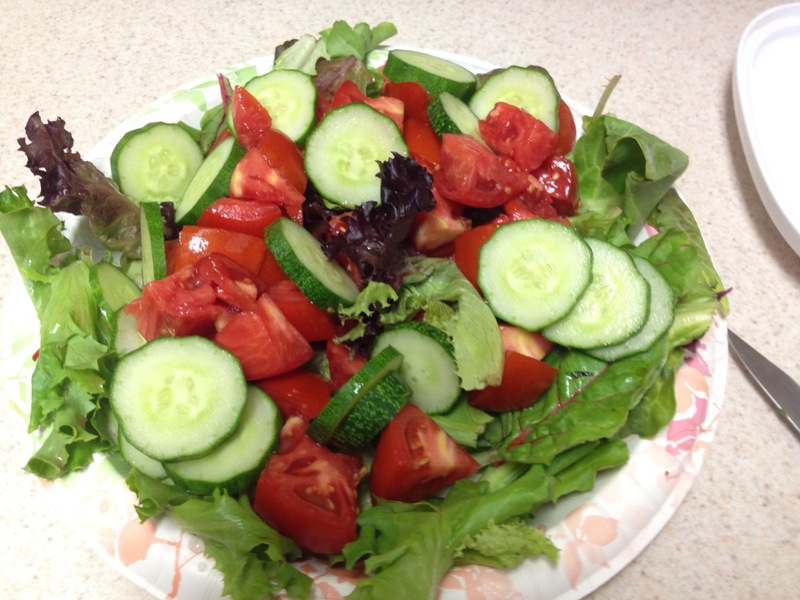 By the time lunch time rolled around I was getting hungry, so I pulled out my salad. It was HUGE! It completely filled my large plate and was piled high. 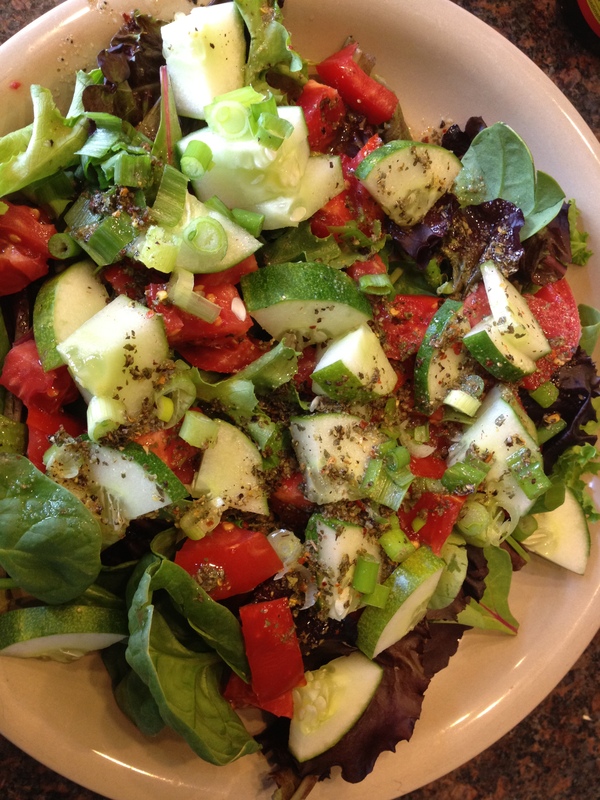 I had made a special dressing for it since I was now off oil. No more oil and vinegar dressings. Also, no more added salt (it took me a few weeks to realize that I should cut out the salt from diet.) I experimented quite a bit to come up with a good dressing without the oil or salt and I think I have come up with some pretty good ones. This one has my dressing on it. I will have to share some of these recipes in a future post. Yes, the dressing was a little more runny but it flavors the salad wonderfully. This is significant because I have always taken my salad dressings seriously. Basically, my dressings involve my favorite vinegar for the day, a little water, one squeezed lemon, all mixed with a pretty good dose of onion powder and garlic powder, and a dose of freshly ground black pepper, ground thyme, basil, oregano, and, for a bit of a kick, crushed red pepper flakes. My last batch also included a little bit of sage (this turned out to be a pretty potent dressing and I have quit using the sage in my dressing.) I put a little more of these spices (particularly the onion and garlic) than what you might find in the commercial brands, but I have to do SOMETHING to boost the flavor since I cut out the salt. Believe it or not, these dressings are filled with zest and do not have that bland no-salt flavor. By the way, I found that onion powder and garlic powder can remedy blandness on a variety of no-salt recipes. 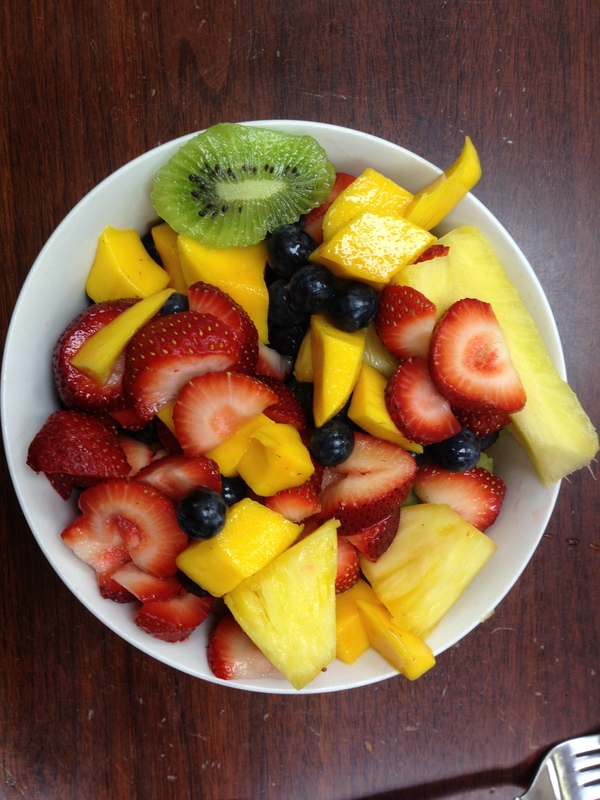 In addition to the salad, I had a large bowl of fresh fruit. This included a mango, blue berries, strawberries, and fresh pineapple. I also had a few Clementine or Mandarin oranges on standby just in case I started to get hungry. The combination of the large green salad and the assortment of fresh fruits left me feeling nourished and very satisfied, for a while at least.